I’m a purist in many ways. With few exceptions, I don’t like fusion—unless I’m creating the fusion. When given the choice, as I always am, tap water works for me at a restaurant. I scoff at all the sauces presented to compliment a broiled or grilled piece of prime meat that should need no compliment. I don’t buy flavored seltzers. 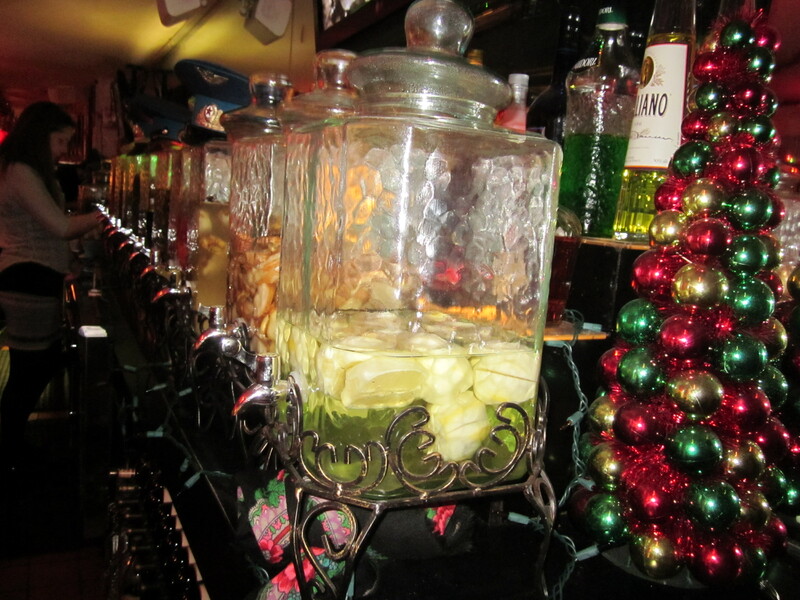 If I want lemon or lime, I can easily add my own to plain seltzer. And the same can be said for vodka. Who needs cranberry flavored seltzer when a splash of cranberry juice will suffice? That is, unless I’m in the outstanding Russian Samovar, sitting at the bar and trying to decide which of their house made infused vodkas I should order. Maybe start with a shot of ginger followed by the coriander? See, there are exceptions. I’m not totally unmovable on this. The state of today’s pizza, I’m afraid, has been a serious blow to my purist sensibilities. You enter a pizzeria now and the cold, congealed varieties presented under Plexiglas counters are staggering. The pies are covered with everything from broccoli to kale, from barbecued shrimp to Buffalo chicken strips. 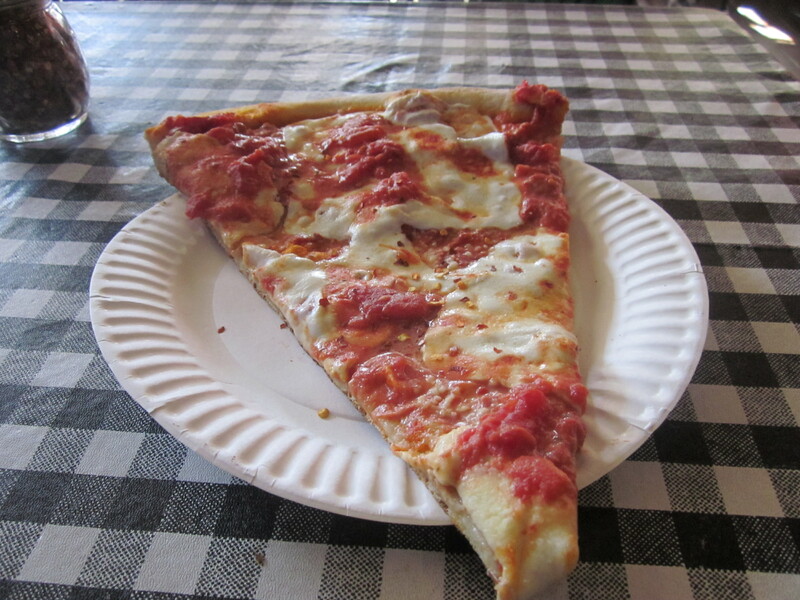 I like my pizza with tomato sauce and mozzarella; preferably more of the former and lighter on the latter. I have been known to throw on some anchovies to improve a mediocre pie. Beyond that, I have no interest in sausage, pepperoni, meatball, mushrooms or any of the usual toppings. Adding to the ever-growing assortment of pizzas is pizza with “vodka” sauce—the spin on penne a la vodka. I know pizza with vodka sauce is not a new phenomenon. I guess I just put it out of my mind, desperately trying to deny its existence despite it’s increasing popularity. I’ve made penne a la vodka myself. It’s not something I’m particularly proud of. I use cheap, local canned tomatoes. Who cares about the quality of the tomatoes if I’m adding cream to it—and vodka? And when I go into my vodka stash just to have it fuse with the sorry canned tomatoes and cream I cringe. It’s one thing to waste a few splashes of red wine in a sauce, it’s quite another to use some of the precious Russian clear stuff. Well, not always Russian. Sometimes it might be Swedish, Danish, or even from some place in Texas. Penne a la vodka is an amiable and infrequent diversion. It’s like the undercard of a heavyweight bout; the opening act for standouts like Neck Bones Tomato Sauce or Neck Bones Anchovy Sauce, pesto, or the perennial champ: marinara sauce. So why would I ever be interested in the undercard of a topping for pizza? I wouldn’t. Or I thought I wouldn’t until recently. The lure was drawing me in. Was I missing something here? And how could I comment on something I’d never experienced? 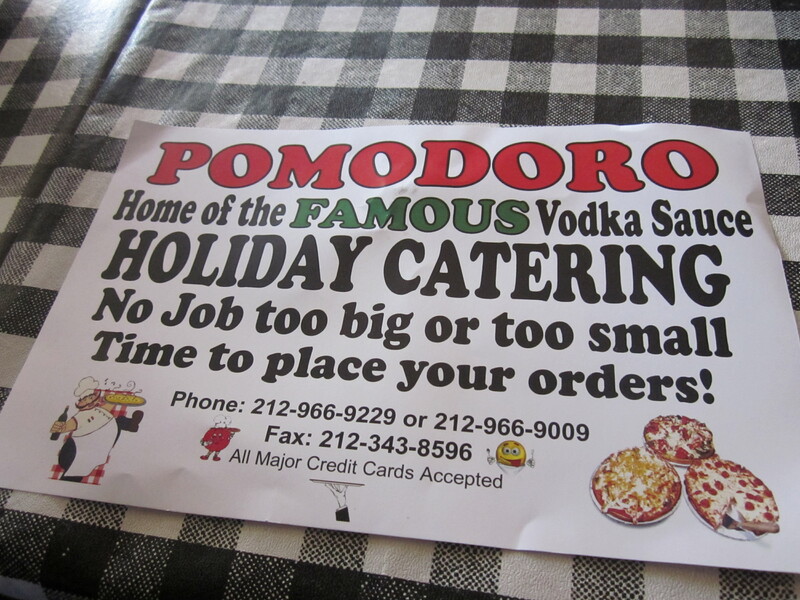 The sign said it all: “Home of the famous vodka sauce.” There was even a banner flapping in the wind above Spring Street advertising “vodka pizza.” The place was called Pomodoro and apparently vodka sauce was their trademark. If I were ever going to experience a slice of pizza with vodka sauce, I would guess this would be the place. 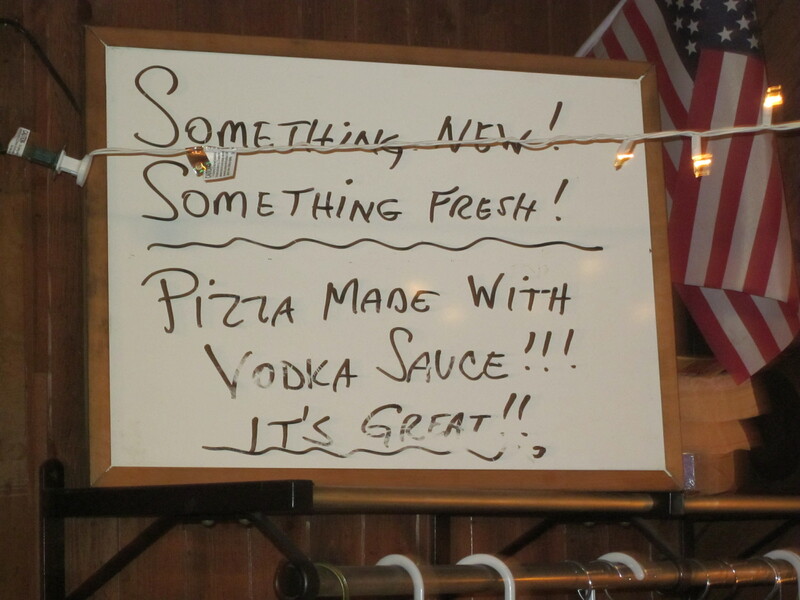 I surveyed the countless array of already made pies under the Plexiglas counter for the vodka pie, but my eyes, inexperienced at least regarding vodka pizza, could not identify one. I asked the man behind the counter for a slice of vodka. He took out a pie that looked like any other “regular” pie and cut out a slice which he threw into the oven to heat. A few moments later it was presented to me. My normal reflex whenever eating a slice of pizza is to grab for the red pepper flakes and sprinkle generously over the slice. I did the same here not knowing that the vodka pizza was already spicy. The slice was coated with chunks of very good, albeit spicy, tomatoes and fresh mozzarella while the only negative was that the crust was a little on the thick side for my taste. It was a more than commendable slice. Still, I was puzzled. 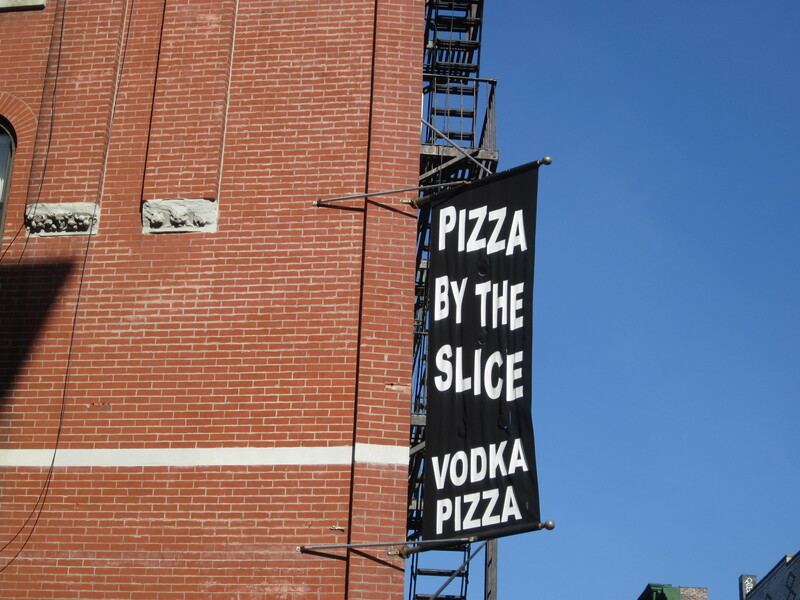 I admit to being a vodka pizza virgin, but was this what a slice of vodka pizza tasted like? It didn’t taste anything like my penne a la vodka. Where was the vodka in the vodka slice? So they called it something other than what it really was. It didn’t matter. I liked the pizza and brought a few slices home to give it another shot. 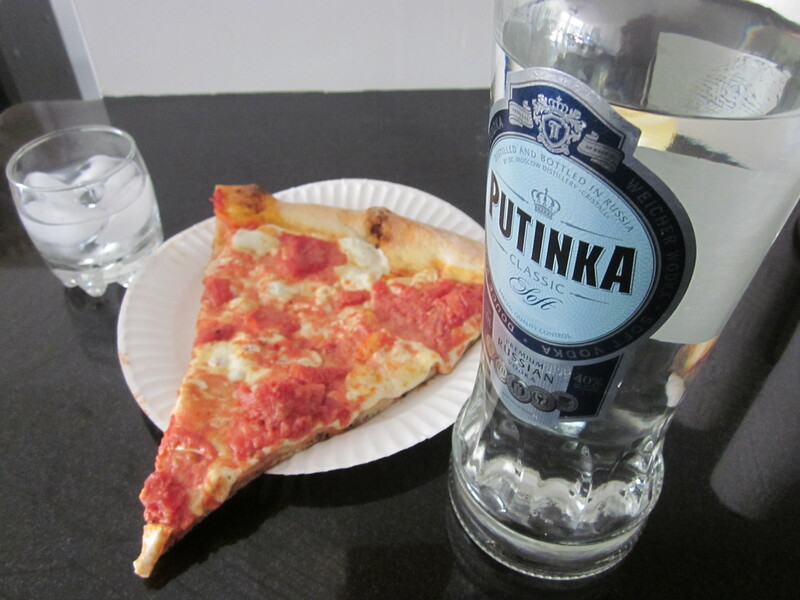 This time I thought maybe, instead of beer, my usual accompaniment to pizza, I would accompany the vodka slice with vodka. 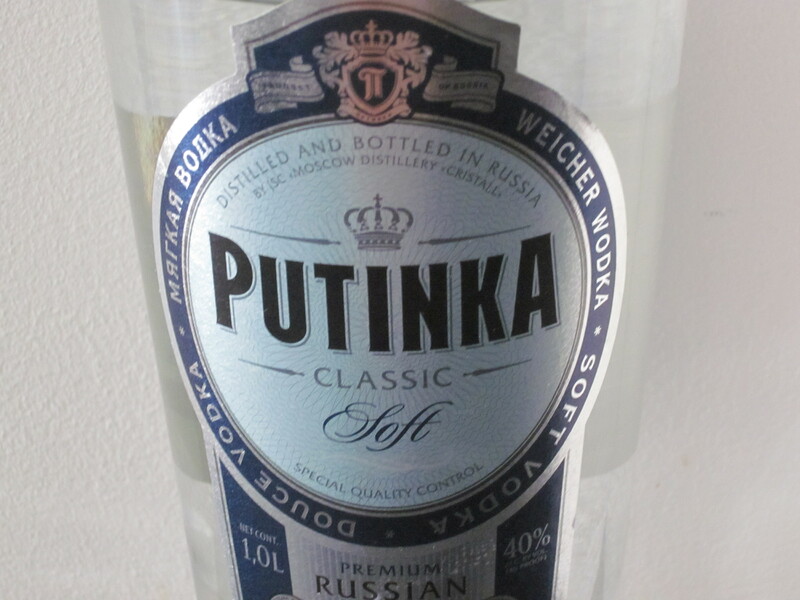 Either way, I reheated the vodka slice and poured a shot of Putinka over ice. I sipped and then took a bite. The vodka, soft or not, gave me the familiar and comforting burn that, I discovered, paired brilliantly with the so-called vodka pizza. I finished the vodka and the pizza a bit too quickly and then realized something that should have been obvious to me—something that conformed to my purist sensibilities. There was no need to search out a pre-made vodka sauce pizza where, most likely, the vodka sauce wouldn’t be up to your own standards. Just like adding your own flavor to your pure vodka, you could do the same with this pizza. All you needed was a warm slice of pizza and a cold Russian in the refrigerator.